The 11th Annual Middletown Motorcycle Mania is Wednesday, August 10 on Main Street Middletown from 4:30 pm. To 8:30 p.m. This event, presented by Hunter’s Ambulance, Hunter Limousines & the Hunter Family, is held in memory of a founding sponsor, Dan M. Hunter, and is driven by Haymond Law. Motorcycle Mania benefits Middletown youth programs, and past proceeds have supported the Hal Kaplan Middletown Mentor Program, Middletown Recreation and Community Services Department youth programs, and the Middletown Summer Youth Employment Program. There is a suggested donation of $5 per motorcycle, and $10 for bikes entered for awards. 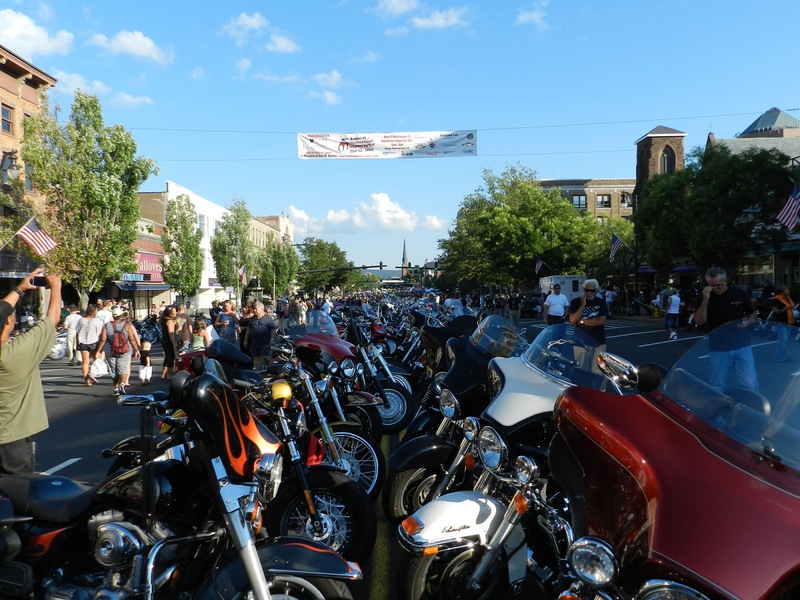 Over 6,000 bikes are expected to converge on Main Street for the 11th installment of this annual city event which will showcase custom and vintage motorcycles. All bikes are welcome to come out for what has become the largest one-day summer motorcycle event in New England. In addition to Hunter’s Ambulance, Hunter Limousines, the Hunter Family, and Haymond Law, event sponsors also include: City of Middletown, Middletown Downtown Business District, Liberty Bank, Bank of America, Eli Cannon’s Tap Room, Gengras Motorcycles, Home Team Supply, All American Productions, Middlesex Music Academy, Lyman Orchards Golf Club, Mezzo Grille, Middletown Area Transit, First & Last Tavern, Untouchable Towing, and WMRD/WLIS Radio. Bike Awards at the 11th Annual Middletown Motorcycle Mania include: The Vern A. Hunter Vintage Bike Award, in Loving Memory of Vern and Barbara Hunter - presented by Hunter's Ambulance and Hunter Limousines, Favorite Vintage European Bike Award – presented by Hunter’s Ambulance & Hunter Limousines, Favorite Vintage Japanese Bike Award – presented by Hunter’s Ambulance & Hunter Limousines, Favorite Vintage British Bike Award – presented by Hunter’s Ambulance & Hunter Limousines, Favorite Vintage American Bike Award – presented by Hunter’s Ambulance & Hunter Limousines, Dan M. Hunter "Functionality with Style" Award - presented by Hunter’s Ambulance & Hunter Limousines, Liberty’s Choice Award - presented by Liberty Bank, The Haymond Law Award – presented by Haymond Law Office, The Gengras Elite Award – presented by Gengras Motorcycles, The All American Productions Award presented by All American Productions, The DBD Farkle Award - presented by Middletown Downtown Business District, The All-American Bike Award - presented by Bank of America, The Fat City Cycle Award – presented by Eli Cannon’s Tap Room, The Rock ‘n Roll Bike Award – presented by Middlesex Music Academy, Best Home Team Motorcycle Award - presented by Home Team Supply, and Mayor’s Choice Award - presented by Middletown Mayor Dan Drew. Entertainment throughout the evening will be provided by WMRD/WLIS Radio, which will broadcast live in front of The Middlesex County Chamber of Commerce, “Screamin Eagle Band”, playing original, classic rock with a southern flair, will perform on the Showmobile in front of Bank of America from 4:30 p.m. to 8:30 p.m., and 104.1 Radio will broadcast live by Brewbakers and iCRV radio will broadcast by South Green. Also, the Middlesex YMCA “Kids Fun Area” in Riverview Center will offer a number of exciting activities for people of all ages. The rain date, if needed will be August 17, 2016.